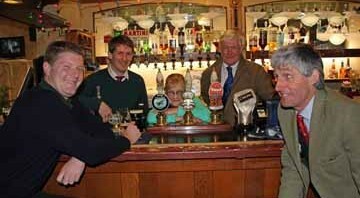 80-year old Dot Gasson, probably Britain’s oldest working landlady, has finally decided to call last orders on a career spanning almost sixty years and well over two million pints pulled. Diminutive Dot, who is barely 5’ tall, has presided over the bar at the Adam and Eve, Townsend Street, Cheltenham, for 35 years. She began working at the pub in 1977, the year of the Queen’s Silver Jubilee, taking over as licensee a year later. 1977 was the also the year that Red Rum won his record third Grand National, Star Wars was released at the Cinema … and Dot married husband Brian. The Adam and Eve is the local for many postal workers at the main Cheltenham sorting office, just around the corner and this Friday evening (14th December) many of them will be bringing a large celebration cake to the pub to wishing Dot and Brian a First Class retirement. A great grandmother, she has four children, two sons and a daughter live in Gloucestershire and another daughter lives in Cyprus, but she hasn’t had time for a holiday for 20 years. Dot isn’t planning on sitting down when she finally pulls her last pint. “I’d like to do some charity work,” she said. This entry was posted in Uncategorized and tagged Adam & Eve, Arkells, Beer, Cheltenham, Real Ale. Bookmark the permalink.